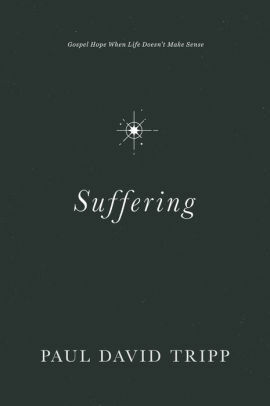 / Suffering: Gospel Hope When Life . . . 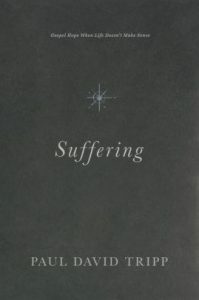 Suffering: Gospel Hope When Life . . .
Paul David Tripp (DMin – Westminster Theological Seminary) wrote Suffering: Gospel Hope When Life Doesn’t Make Sense in 2018. His previous books include Dangerous Calling and New Morning Mercies. Pastor Tripp’s stated purpose in writing Suffering reflects his desire to help those suddenly blindsided by the unwanted stranger of suffering to feel thankful for Jesus, who’s there for you in your pain. Most noteworthy, suffering possess the power to expose what you put your daily trust in. Also, the author stresses, suffering’s not theoretical or impersonal. Rather, it’s tangible and specific. While the Bible honestly and authentically tells the story of suffering, it also give us concrete and real hope. Thus, Scripture works to prepare us for the things we’ll all face. In addition, our lives are shaped not just by our suffering, but also by what we bring to our suffering. In other words, what you carry inside your heart shapes your response to situations more than the specific thing you’re facing. Yet, Pastor Tripp encourages, no valley of suffering is so deep that God’s grace in Jesus isn’t deeper. And that’s important, because the suffering that is so real to you seems unreal to the people around you. Therefore, the Bible always treats suffering as a real, significant, and often life-changing experience. For suffering consists of spiritual warfare. It puts your heart under attack, taking you to the borders of your faith. Also, suffering creates a focused awareness. Part of the burden every sufferer bears. In the process, it plants itself in fertile soil for a whole new set of fears. However, suffering takes place under God’s sovereign rule and happens in the middle of His redemptive plan. So, in the final analysis, God alone determines your destiny. It’s a huge mistake, then, to look horizontally instead of vertically – a wearisome task. As a result, let what the Bible says about God help you interpret your overwhelming circumstances. Don’t let your circumstances redefine your view of God. Because you’ll never find hope in denying the truth, although it’s tempting to downplay the size, power, and potential effect of suffering. In contrast, courageous obedience anchors its roots in a heart that trusts God. Unchecked discouragement, though, becomes your eyes and ears. And, it opens your heart to a lifestyle of complaint. The mind and soul – enemies or allies? NEED TO TALK? JUST CALL OR EMAIL US. John 1:16-17 – Out of his fullness we have all received grace in place of grace already given.